The waste crisis in Naples has been ongoing for more than a week by now. Today (Jan 7), the Italian newspapers are announcing the intervention of the army to retake some control of the situation. The more time goes by, the more Italy looks like the miner's canary of the ongoing crisis. Italy has already cut petroleum consumption of 8% in three years and reduced that of gasoline of 23% in the same period. Last month we had a strike of the lorry drivers protesting against the high prices of fuels. The strike blocked the distribution of goods for a few days and that was enough to make Italy look like a post-holocaust world, with empty supermarket shelves, shut down service stations and people fighting for a seat in buses and trains. That phase was quickly over and everything went back to normal, for the time being at least. Now, we have another crisis ongoing in Naples and in the areas nearby. This time it is the urban waste disposal system that has collapsed. The crisis started after Christmas and, from then on, TV channels in Italy have been showing streets in Naples filled with waste overflowing out of the ubiquitous Italian "cassonetti" (public waste bins). People are reporting that the piles are so high that are reaching the windows of the first floors. Adding disaster to disaster, the height of the crisis came during the last days of the year, when it is traditional in Italy to celebrate by exploding fireworks. Apparently, some people found that it was fun to shoot the fireworks at the waste piles and setting the whole mass on fire. This may have seemed to some a quick way to get rid of waste. Too bad that the combustion of waste in these condition generates poisonous compounds of all sorts, including the famed dioxins. In addition, riots and street blockades have been going on during the last few days, when the authorities have tried to reopen an abandoned landfill in the area. Right now, the situation seems to be still critical, however, as usual for Italy, a certain degree of social resilience seems to be able to avoid major catastrophes, or at least has managed to do that so far. Is the ongoing disaster in Naples related to peak oil? Not directly, of course. The question of waste in Naples is a long story that would need entire books to be told. Let's say that the situation that we are seeing now compounds all the problems of waste management together in an explosive mixture. First of all, it is the result of a series of strategic mistakes. The authorities have been slow in implementing plans for facing the increasing flow of waste. When they have done something they have done it wrong, sometimes worsening the problem. Naples lacks of plants for waste processing, there are no plans and facilities for recycling, there has been no attempt to reduce the production of waste in terms of overpackaging and non reusable goods, the citizens of Naples have never been given a chance and the proper facilities for differentiating their waste. A final factor in the crisis is the phenomenon of the "Camorra," a local criminal organization similar to the better known Sicilian "Mafia". The exact role of the Camorra in the present mess is difficult to determine, but it is generally reported that it has infiltrated the waste management companies and agencies at all levels. These specific problems of Naples and have caused the ongoing crisis. However, waste management is a general problem that affects the economic fabric of all Italy and of Europe as well. Waste is a consequence of the abundance cheap oil that creates the general abundance of household and industrial goods which are the turned into solid waste. This waste is collected and transported at long distances by lorries which use fuels derived from cheap oil. The machinery that processes waste needs fuels and electricity derived from fossil fuels and cheap oil in particular. Even incinerators, called by some optimists "waste to energy" systems, are designed around a "fuel" which is supposed to contain a minimum amount of plastic that, in turn, is derived from crude oil. The whole system of waste treatment has been designed in a vision of abundant resources. The oil crisis is weakening the economic system of society and is rapidly making the current model of waste management obsolete. So, Naples could be a miner's canary of a problem that we might soon see spreading all over Europe. But there are also some elements of optimism. Waste is a "problem" only as long as we think we live in a world of infinite resources, or nearly so. That is quickly changing and we have to start to think of waste as a stock or resources. Paradoxically, peak oil might reduce the gravity of the problem by slowing down the production of waste and encouraging recycling. That may be easier to do in some places than in others. In Naples, a couple of months ago, you could see on the main avenue signs that said, "copper bought here", something not so easy to see - say - in downtown Brussels. An economy not yet completely globalized, such as in Naples, can quickly turn into exploiting the opportunities that waste recycling can give. Naples, in this case, could teach to Europe a lesson on what to do to adapt to the crisis. So Pakistan is not alone in corrupt public waste collection and disposal system!. A sigh of relief :). Naples is reputed as one of the most chaotic cities in Italy, and that says something. It's a mystery how they have kept it going for so long in the first place! I would be careful to read any peak-oilishness into this event. Is the ongoing disaster in Naples related to peak oil? Not directly, of course. The question of waste in Naples is a long story that would need entire books to be told. I think it’s interesting to see how mundane yet vital systems like waste disposal can collapse. Peak oil will likely result in a series of system collapses so it’s good to take a glimpse at what collapse looks like, even if the direct causes vary. It's related in at least a couple of ways. There's the Tainter connection - the hierarchy required by the society is fueled by energy. And there's the entropy connection - where the trash is low entropy being converted to heat. Resource depletion and sink depletion. Both resources and sinks are capital outside the standard economy. If one thinks back to Hall's diagram posted on Momma TOD a few days ago, this could represent a form of triage, where some services are simply abandoned. That seems far fetched. At first. What's happening is the people on the ground are protesting because there are not enough resources to go around. The problems of Naples could be of any city. Ultimately the trash is hauled away in trucks and so as oil prices rise so will waste disposal costs. Many of these costs are levied on homeowners who get no choice in paying wahtever the city demands. I can see a day though when this waste is coveted for the treasure it contains. The organic should be composted, the minerals recovered, the methane extracted, the chemicals distilled and the plastic....damn. I knew there had to be a flaw. Old landfills will become the new open cuts PPO. At least the Neopolitans don't have to dig it up first. They could start right there on the street. Send Rudy to Naples, he broke up the mob-controlled garbage cartel in New York. Italy's government has failed so many times that I have a hard time taking any bad news from Italy seriously. There will always be an Italy no matter what happens. Perhaps the real problem is that we produce waste in such prodigious quantities in the first place. Too many single-use containers. Nearly everything we buy is wrapped in paper or plastic in one form or another that is a pain to remove and then gets discarded when you get home. The first step ought to be to avoid using anything that is single-use, and if it is unavoidable, try and use something that is recyclable. Back when I was single, I would only need to put out my trash bin once a month or so. My neighbors would have the thing out twice a week, and it was stuffed to the gills. I have no idea what they were buying that they generated so much trash. Getting to a lifestyle where there is absolutely nothing to be discarded would be difficult - that's where recycling ought to come into play. Add composting (a step that I never even took), and you ought to be damned close to having no waste whatsoever that needs to be removed. The Camorra is in the rubbish business for various reasons. The main way it makes money is by illegally dumping industrial and hazardous waste in domestic landfill sites as well as unauthorized sites across the countryside. It also gets paid by district politicians to go and dump their rubbish on an another districts landfill sites, or the reverse, pays local politicians to allow them to dump rubbish from elsewhere into theirs. Naples had its landfill sites filled over the limit ages ago by this kind of activity. The Camorra actively torpedoed every attempt at modernizing the waste management system and now the army has been sent in. Not to crack down on the Camorra of course, but the local people protesting the corruption of the politicians. There have been a few reports about Italian waste being brought to Germany in trains. We in Germany have facilities to burn waste and dispose the leavings, but this is an expensive solution for Italy. And more, it seems that this solution can't last for long. Burning waste also faces opposition here, with many experts underlining that avoiding waste is the only real solution. It appears to be true. About one thousand tons of waste are reported to leave by train every day from the Naples region to Germany, to be burned there. I think that is an arrangement convenient for Germany. Germans are so efficient in recycling that without Italian waste, their incinerators would run out of fuel! Thanks for the post on this issue, Ugo! Can you explain to me a few things I don't understand and have trouble finding out in the English language media. 1. Rubbish is energy. Why aren't parties fighting over the chance to use this source? In Finland it's the opposite: companies want to secure their rights for landfill biogas production or solid waste burning. It's a resource, not a problem. Why not the same in Naples? (I'm now setting aside environmental protests on the issue, just concentrating on the energy equation). 2. Why is there a problem to begin with? And I don't mean strikes or already overfilled landfills. I know you said the answer could fill a book, but... These are long terms problems that take half a decade a minimum to develop. In the press I've read, the blame has been put on organized crime who supposedly control waste management in the area and corrupt officials. Is it really so? What is evident to me is that something _is_ broken in the municipal system of Naples, when they can't plan ahead and get rid of their garbage which is also a form of energy (i.e. money). Rubbish is energy, yes. Why is it not burned? I must confess that I don't know the answer. But I may try an interpretation, anyway, noting that waste to energy facilities require big investments. Also here, there is a long, long history that involves an Italian company named Impregilo, that should have built a waste-to-energy system, but they didn't. The story is awfully complex, they built a facility that made fuel for incinerators in the form of something called "ecoballe" ("ecobags"). These ecobags were made of trash packed and wrapped into a cube. For some reason, these ecobags could not be burned, but have been accumulating in huge piles somewhere near Naples. Surely, these ecobags have economic value as fuel, and there seems to be some fighting ongoing on who should burn them. There is even a proposal to burn them in Germany! Here, organized crime may have played a role: the ways of the Camorra are mysterious. About why there is a problem; the idea that I have is that Naples is no different than any other place. The problem is showing up there earlier than in the rest of Europe because, first, the high demographic density of the area (I forgot to mention this point in the post) and, second, economic weakness in comparison to other European cities. Organized crime is a factor, of course, but I think it is more a consequence than a cause. Anyway, I think that the main cause if the weakness of the local economy that prevented the kind of investments that have solved the problem in other places, say, in Germany. In the whole story, I see a certain "post peak" flavor. The peak is causing a further economic decline and it is making the problem worse. Maybe it is because of this that the situation has exploded right now. Maybe I am wrong, but I see the problem spreading north. Burning of trash is really problematic. Yes, it does represent energy but what kind of energy. It is probably closer to coal or perhaps lignite or peat. Waste to energy systems burn at a rate that is designed to optimize steam generation for electic turbines. The mixed nature of many waste streams often does not allow adequate combustion. Some portions are too wet, others have a low heat value. Many existing plants produce significant quantities of PIC's (products of incomplete combustion), sub 10 micron flyash that baghouses cannot capture, and are dioxin generators. Most waste to energy facilities still generate 15% or higher ash streams which still need a landfill, sometimes a hazardous waste landfill. They tend to get sited in poor neighborhoods so rich folks won't have to deal with health issues. Trash incineration is inferior to landfilling. Not producing so much in the first place is best. Despite my best efforts at recycling, reducing, and reusing my bin still ends up with a fair proportion of soiled food packaging - plastic or paper. It does seem to me to be a waste to landfill this calorific material. I assume WTE plants have some capability to contribute towards peak capacity unlike most renewable systems? A reason because the Naples politicians have not interest in burning the waste in incinerators is this: in Italy the bulk of the taxes are paid to the central administration and not to the local administrations. Their main resource is from the central redistributions. So they have small interest in developing incinerators (big troubles, no money) and big interest in keeping the emergency continue, so they are able to justify emergency legislations (and big money will be redistributed to the friends). Just curious, how much does petrol cost in Italy today? Diesel? The county in Colorado in which I live has one landfill for 500,000 people, and it is rapidly reaching its capacity. No plans to build a new one that I have heard of, and we'll be trucking trash 30 miles each way if there isn't one soon. At least we have a recycling system in place. The trash industry in the US is run by the mob in some cities, but even where it isn't there are some shady tactics. One of those is for a company to run a landfill for years until it is about to be full, then sell it to a shady under-capitalized sham company to unload the liability onto a soon-to-be-bankrupt shell. The taxpayers hold the bag. Petrol (aka gasoline) in Italy costs about the same as in the rest of Europe; just a shade more. The same for diesel. Gas used to cost much more here, many years ago. It was one of the reason why Italians used those very small cars, like the Fiat 500. Now, Italians want SUVs as everyone else!! I lived in Naples for two years and graduated from high school there in 1978 (my father was in the Air Force). The garbage was a big problem back then too. It was common for the garbage workers to go on strike, and then everything would pile up. The mafia was also very influential. The gatekeeper at our housing area was shot - we think because he didn't pay protection money. Good post. 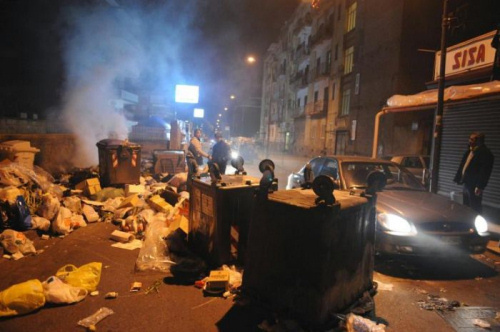 Traditionally, the Camorra, and the Mafia, have been involved in waste disposal. It is very lucrative, as many corners can be cut. It is a favorite. Out of sight, out of mind, the consequences be damned. Chalabi (of Iraq fame) has also been involved in waste disposal scandals. In Switzerland, his family, and he (in some measure; only his brothers got prison sentences in absentia) have been convicted of financial fraud (banking operations) which one might expect, but also scams in the big business of garbage disposal! The linked article is in french, and very brief, this stuff never made it to the mainstream US press. That just popped into my mind, only to show that it is easy to scam off the top; the payee is usually the Gvmt. or the locality, and they don’t check anything consistently, they prefer to shell out and not bother, garbage is not glamorous or fun, as long as it goes away all is fine. It is hard to sell garbage in Europe. The Swiss sell some of it - as it is well, or even supremely, sorted. Grade A..or some such. It is used to make plastics, wood composites, compost, recycled paper and cloth products, etc. I never heard of Italian garbage having any takers. But who am I. As Garrett Hardin said, "There is no 'away' to throw to." McDonough & Braungart say much the same thing in "Cradle to Cradle:" There is no "away." They say we must view these streams as nutrients, not waste, and shepherd them through their lifecycles without cross-contaminating them. The biological nutrients go back into our farms and gardens, while the industrial nutrients would ideally re-enter the production cycle as virgin materials. No more downcycling; It's all about intentional design for "upcycling," so that waste streams have the potential to be positively beneficial to the environment and the economy, both biologically and technically. But it means restructuring current business models to avoid externalizing costs, by which even the modest effort needed for consumers to segregate waste streams is deemed too much of a burden. As a result, we end up with mountains of sludge that can't be burned efficiently for energy cogeneration, and that releases toxins when it is incinerated. The most hopeful point the authors make is that this is not an adversarial approach to cleaning up the way we do business, nor is it merely a route to efficiency, to being "less bad" in pursuing business as usual. It's a way of taking a longer view that helps on all fronts, by building sustainable factories, by viewing suppliers as vendors of services rather than goods per se, and by maintaining an accounting and accountability for all the materials we use and reuse, so that our processes become as cyclical and organic as the earth from which they came. Italian government inefficiency and corruptness? Say it ain't so! When PO does start biting there, they may as well commit suicide en masse. The governments of the world are inept enough, for Italy it will be a fatal blow. The upside of waste crisis like this one or when the waste removal crew goes on strike is that people can then visualize the huge amount of garbage we produce. But I am afraid not so many people share my point of view, the general view it is more like "it's a shame this is like the third world", they don't realize it is a rare opportunity to see how wasteful we are. The definitive social-psychological-anthropological study of garbage in our current culture would be Grant Morrison, The Filth. Enjoy. Naples has had the garbage problem for centuries. Read its history. If the problem is still there it is obviously accepted by the leadership of the city of Naples and of the Campania Region. The Mayor of Naples, Rosa Russo Jervolino and the Governor of the Campania Region Antonio Bassolino should resign immediately and refund to the city and the region al least 5 years of wages for having accepted a paycheck every month and not having performed their duties. It is a shame that they are still in power. They are the first two people to blame for the actual garbage disaster and their behavior leads to believe that they have connections with the camorra. Rosa and Antonio should resign immediately and the power given temporarely back to the governament in Rome or to the military. I was in Naples a couple of years ago and agree it is a pit. Up the hill leading to Mt. Vesuvius is littered with garbage. I saw drivers pull off the side of the mountain roads and fling trash out the window in the general direction of waste bins.